Disclaimer: I was provided with the Skulpt Aim for review purposes by Raynforest. All opinions are my own, and this post was not otherwise compensated. No matter where you are on your fitness journey, you probably want to see some improvement from where you are now. How can you know you’re improving if you can’t measure it? Going by feel has its merits, but it can be subjective based on what else you have going on; how well did you sleep the night before, what did you eat, how much stress are you under external sources, etc.. If you measure your athletic performance numerically, i.e. how fast you can run a certain distance, how much you can lift, at least you have some quantification, but it’s still subject to those daily variables I just mentioned. Just about every fitness blogger has a post about why the scale isn't a good measure of health and wellness, and Body Mass Index still gets a lot of mainstream attention, in spite of being tied to weight. If an obese person whose weight comes from a spare tire of fat and a power lifter whose extra weight comes from gigantic muscles have the same height and weight, they’ll have the same BMI value, even though they present entirely different pictures, health-wise. Body fat seems to be a decent thing to measure, most of us would like less, and certain types of fat (e.g visceral) or locations (belly) are linked to many negative health outcomes. The most accurate test of body fat involves getting immersed in a tank of water which makes it terribly inconvenient for tracking at regular intervals. Calipers are accurate if you really know what you’re doing; I got myself a cheaper more ‘entry-level’ pair last year, but I’ll be darned if I could get similar measurements from day to day. Bathroom scales that use bio-electric impedance analysis sound promising (I have one that I use from time to time), but trying to get a measurement of your whole body’s fat composition from the soles of your feet seems sketchy, and indeed there are a whole bunch of dependencies like not having eaten, slept or exercised within something like 5 hours of the measurement (when would those conditions ever be satisfied realistically?). Enter the Skulpt Aim. You take measurements directly on different parts of the body; the general snapshot it asks for takes for measurements: right side bicep, abdominals, tricep and quadriceps. You can also measure (left and/or right) hamstrings, glutes, calves, upper back, lower back, biceps and forearms. 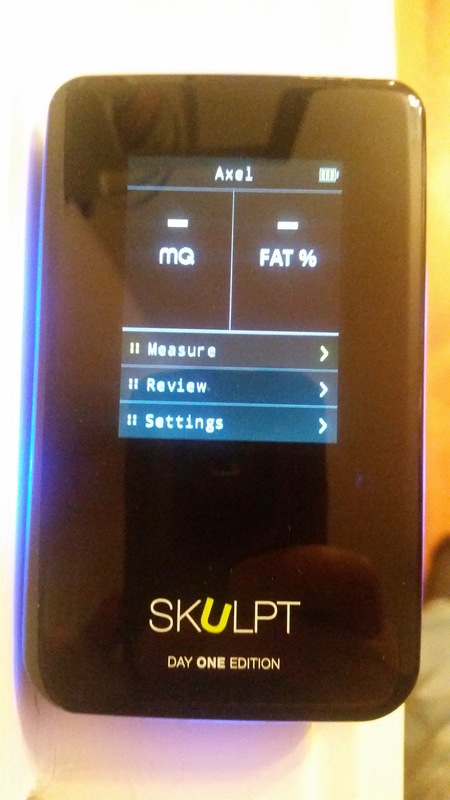 The Skulpt Aim also measures MQ or Muscle Quality, which Skulpt equates to IQ, except for muscles rather than intellectual ability. 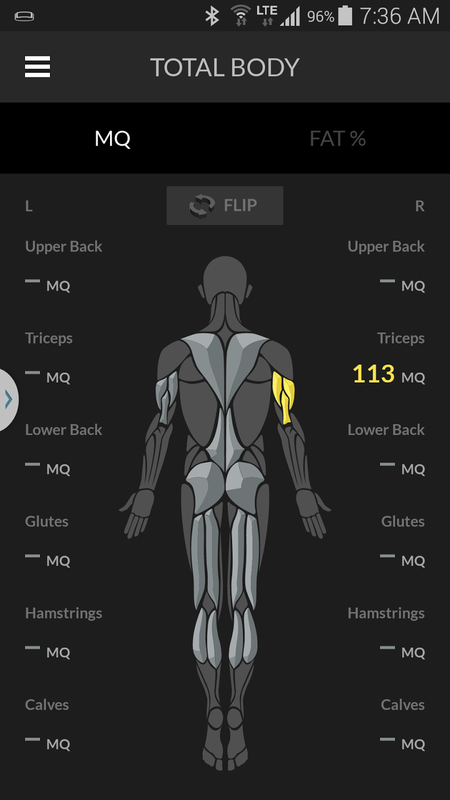 Higher MQ scores correlate with stronger, leaner, more defined and firm muscles. That way, you can measure how your training regimen is improving your physique and physiology, muscle by muscle. When I got my hands on the Skulpt Aim, I was pleased to see it had a relatively simple interface. One button on the left side for powering on/off or selecting a menu entry and two buttons on the right side for scrolling through menu entries - one up, one down. The sensors are at the back, and the screen is on the front, with fairly simple menus. 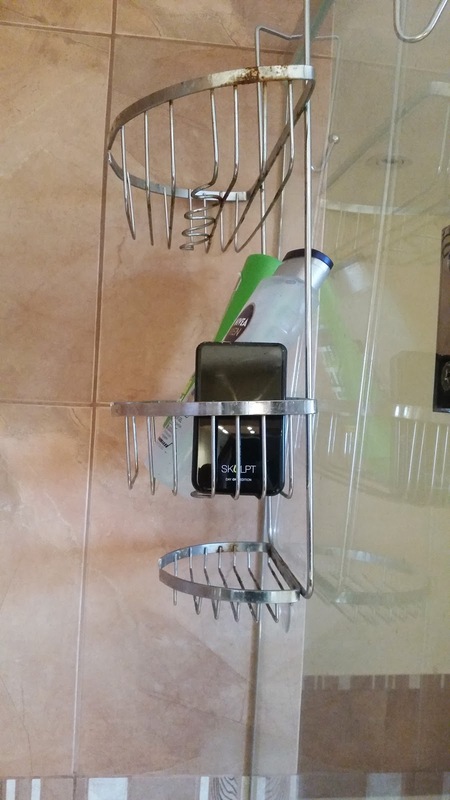 I've found it easiest to simply keep my Skulpt Aim in my shower caddy; it’s splash proof, and taking measurements after my shower (either as part of a morning ritual, or post-workout) is easy since I’m already wet, and all muscles are... *ahem* uncovered, shall we say. Another great feature is a multi-coloured LED around the rim of the device that flashes as you scan the muscle. It changes to solid when the scan is finished. This is especially handy when you scan muscles that are hard to reach so you can’t see the screen to know if the scan is finished, e.g. calves, back, triceps. 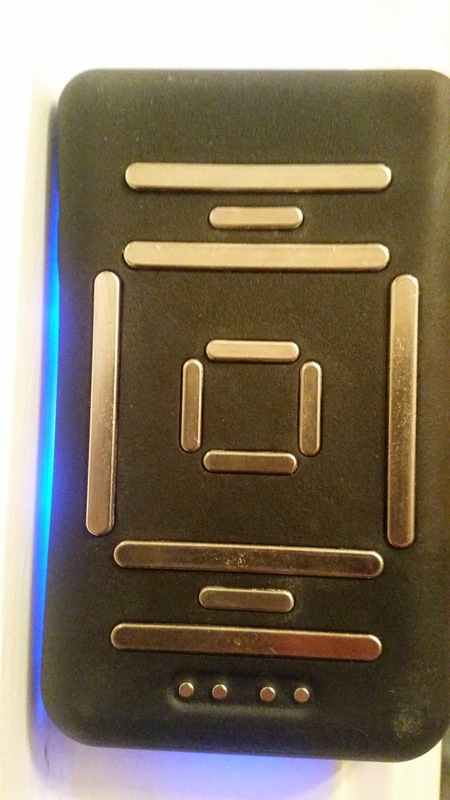 I could usually see the side edge of the device no matter where I measured, but sometimes it was easier to look in the mirror to see the flashing end. 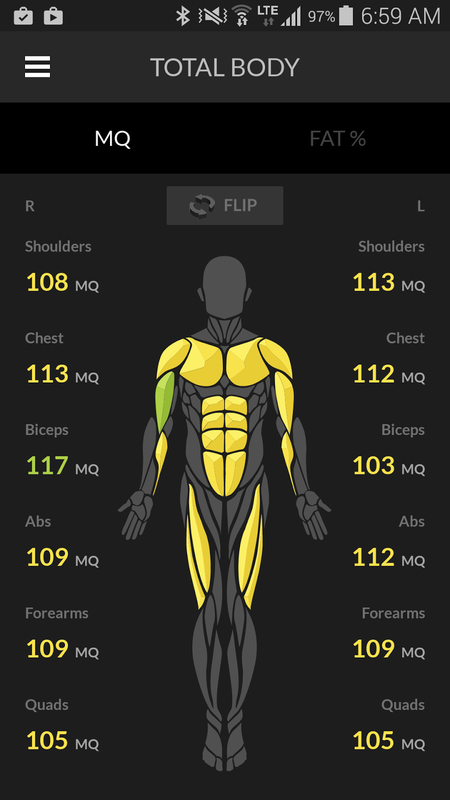 I liked navigating the app more than on the device - a smart phone touch screen is more familiar than the button layout of the Skulpt Aim, and there are simply way more options. The app only asks for one permission when you install it - access to Bluetooth so it can pair with the Skulpt Aim - rather than your location, friends list, camera, custody of your first born child that so many apps ask for, which is refreshing. Bluetooth pairing worked quickly and easily. The following charts show the progress I made (or didn't make). 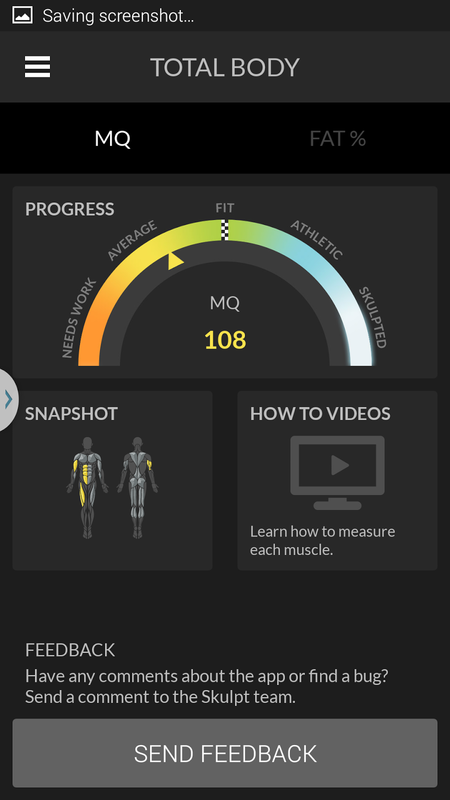 More than anything else, I used the ‘Total Body’ measurement which uses right bicep, tricep, ab and quad to take an average picture of your body, so I have the most data for those muscles. The big take-aways I have are that my glutes and hamstrings are the fittest (and most lean) parts of my body. Which is not too surprising for a triathlete, especially one who’s stronger on the run than the bike. I was proud of my posterior chain and hill-climbing at the beginning of the off-season, and I've been incorporating dead-lifts into my strength routine since last December or November, so that’s nice to see. I made this chart myself. I know it's a little dense. Having quads that are much weaker (less fit according to MQ) than my hamstrings is a bit of an alarm for me. I knew I needed to get stronger on the bike, and muscle imbalances can lead to injury so I started trying to focus on isolating the quads in my strength routine since I first saw that. Overall, I've seen my Right Quad MQ go from 102 to 110, so that looks good. We can also see differences between right and left sides. This may be due to actual differences between my right and left side muscles, or due to how I’m measuring the muscle. Given that I can see fluctuations in MQ and Body Fat from one day to the next consecutive day, it has to be at least a bit of both causes. The nice part is that if you take more than one measurement in a day, the progress feature of the app will report the average value of that day, so you can use the law of averages to get the best reading if you want more accuracy. Does this device sound useful to you? What quantities do you like to track when it comes to your training?